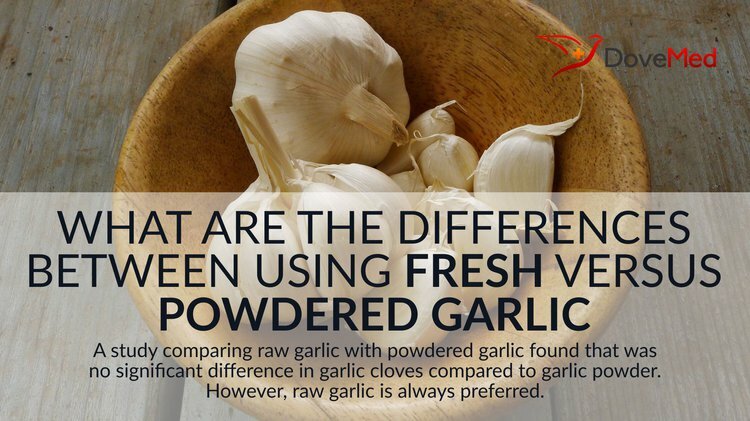 What Are The Differences Between Using Fresh Garlic Versus Garlic Powder? Garlic is an herb and is best known as a flavoring agent for food. Garlic has also been used as a medicine to treat a lot of diseases and medical conditions. Garlic is an herb and is best known as a flavoring agent for food. Garlic has also been used as a medicine to treat a lot of diseases and medical conditions. Fresh garlic or raw garlic is normally used in regions where garlic is grown and is readily available. However, garlic powder, which is a form of dehydrated garlic that is powdered, is commonly used for seasoning. Garlic’s compound bulb is the part of the herb that is used for medicinal purposes. Each of the bulbs has about 4 to 20 cloves, and each clove weighs about a gram. Garlic contains a chemical called allicin, which is responsible for its beneficial values as well as its distinctive smell. Not just allicin, but there are also other sulfur-containing compounds that help garlic achieve its much noted beneficial values. Minced garlic or fresh garlic cloves are much fresher than the garlic powder, and they have a much strong flavor. Use of fresh garlic would make it a recognizable component in any dish. Fresh garlic also contains a compound known as hydrogen sulfide. This is the main component that is attributed to relaxing the capillaries and the blood vessels that surround the human heart. Consumption of fresh garlic would put less strain on the heart muscle and could pave the way to a healthier heart. Clove garlic also reduces the level of unhealthy bacteria in the stomach and acts as an antibacterial agent. This can help in reducing the chances of a stomach infection. Researchers from The University of Adelaide suggest that consuming fresh garlic can aid individuals with hypertension in lowering their blood pressure. On the other hand, garlic powder does not have the hydrogen sulfide that is necessary for a healthy heart. Still, garlic powder is not entirely devoid of its benefits. It can still be used for its antibacterial effects, but in a much more reduced form. A study funded by the National Center of Complementary and Alternative Medicine compared raw garlic with powdered garlic, and there was no significant difference in bad cholesterol amongst the groups. This means that both the garlic cloves, as well as garlic powder, are beneficial, though raw garlic is always preferred. A 900mg amount of garlic powder would contain 5.4mg of allicin, which is the key component of garlic, whereas fresh garlic cloves of the same quantity contains about 5mg to 9mg of allicin. One benefit of powdered garlic is that it lasts longer than fresh garlic cloves, as the latter may begin to sprout with time. Natural Medicines Comprehensive Databases rates garlic as possibly effective to treat a series of medical illness like athlete’s foot, ring worm, tick bites, and even stomach cancer. Be it fresh garlic or garlic powder, it is an herb that is used widely all over the world and is loaded with health benefits that one should not ignore. Krest, I., & Keusgen, M. (1999). Quality of herbal remedies from Allium sativum: differences between alliinase from garlic powder and fresh garlic. Planta medica, 65(02), 139-143. Ross, Z. M., O'Gara, E. A., Hill, D. J., Sleightholme, H. V., & Maslin, D. J. (2001). Antimicrobial properties of garlic oil against human enteric bacteria: evaluation of methodologies and comparisons with garlic oil sulfides and garlic powder. Applied and environmental microbiology, 67(1), 475-480.